Talk host and radio storyteller Bruce Williams, whose syndicated show ran for more than 29 years, died Saturday, February 9, at his home near Tampa after a brief illness at age 86. Spanning a career that lasted more than three decades, Williams created a loyal listenership hundreds of thousands of people strong with his informative and entertaining program, delivered in his signature deep, warm, welcoming voice. One of the most unusual and remarkable facts surrounding Williams' Hall of Fame radio career is that it did not begin until he was well into his forties. Born February 18, 1932, Williams grew up in East Orange, NJ. Born with a sense of business, at age 11, he devised a way to address one of the many shortages common at the end of World War II by melting down lead pipes and casting them into toy soldiers. He spent time driving an ice cream truck in New York City. He was also a taxi driver and drove a beer truck. For seventy years of his life, he spent the holiday season selling Christmas trees in New Jersey. On the white-collar side, Williams sold insurance, owned a flower shop, a car rental agency, a barber shop and he owned and operated several nightclubs. His career began in 1975 at Talk WCTC 1450 in Brunswick, New Jersey, where Williams hosted a show called "At Your Service." After some time, his success took him to WMCA 570 AM in NYC and his momentum and audience continued to build. Williams growing popularity brought him to the attention of radio executives at NBC who were searching for a host of a national nightly advice-oriented talk show. Williams was chosen and his program launched in November, 1981. It was from this platform, his reputation as a broadcaster blossomed. 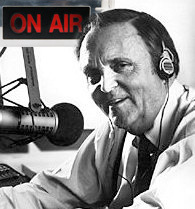 Over the next three decades, Williams' voice was heard coast-to-coast as he became one of the most listened to talk show hosts in radio history. In 1999 when he was inducted into the National Radio Hall of Fame in Chicago.